Your mother hollers that you’re going to miss the bus. She can see it coming down the street. You don’t stop and hug her and tell her you love her. You don’t thank her for being a good, kind, patient mother. Of course not, you hurdle down the stairs and make a run for the corner. Six high school kids (some popular, some not), two eighth graders (one a tech genius), and six little kids trapped together in a chain superstore build a refuge for themselves inside. While outside, a series of escalating disasters, beginning with a monster hailstorm and ending with a chemical weapons spill, seems to be tearing the world, as they know it, apart. Dean's day started like any other, the mad dash to the school bus, finding a seat where he could blend in and go unnoticed, on his way to school where he would do the same. But when a soft plink sound shatters his morning, this day will be anything but. A light hail hitting the packed bus, suddenly turns into deadly chunks of ice falling from the sky, taking the driver by surprise and causing the vehicle to veer out of control. What ensures, is absolute mayhem, with screaming teens fearing for their lives. This is no ordinary hailstorm. The kids from both Lewis Palmer High and the grammar school in Monument, find refuge within the local department store, Greenway. Once the ice storm subsides, the only adult within the group leaves, to send word where the children are, seeking rescue. But she never returns. The riot grills on the store are activated just in time for an earthquake and the store plunges into chaos. Items breaking, shelves toppling and the worst is still to come. The news network is reporting a volcano demolishing an island on explosion, raining over five hundred billion tons of rock and lava into the ocean. The impact created a mega tsunami, a wave measuring half a mile high and moving at six hundred miles per hour, growing wider as it approached the United States coast. It's what lead to the severe weather pattern across the country, creating storm supercells. A toxic plume has been released into the atmosphere and it's effects are reliant on blood type, from those who experience hallucinations, to skin blistering, death or impotence with the failing of reproductive organs. But those with Dean's blood type fare far worse, the toxic smoke turning even the mild mannered into homicidal maniacs. They need to seal the store. The teens and middle schoolers work together to survive the initial onslaught of danger and destruction, with only snippets of news from the outside world, via an old television found in the home media department. Forming a democratic society, voting Niko the boy scout as their temporary leader, much to the annoyance of arrogant football players Jack and Brayden. Everyone finds a use, from restocking shelves, to preparing meals and tending to the smaller children, trying to survive the apocalypse right on their doorstep, literally. But when two men arrive asking for assistance, they've brought word from the outside world, and life inside the department store sounds so much more appealing. Survivors are being evacuated, heading to Detroit, but how do a group of children make it beyond the parking lot, into the destruction and ruin which was once their city? They may not have a choice, when a situation escalates quickly within the store and weapons are drawn, one of their own is shot. When one of the unlikely band of survivors takes a hit, the others are determined to reach help, but is there anyone left in town who can help them reach safety before it's too late? 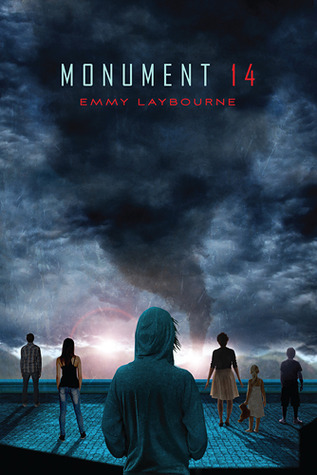 Monument 14 was entertaining for the most part, a little dull at times, but good nonetheless. Dean is our main character who is generally the voice of reason, apart when it comes to fellow trapped teen, Astrid. He's quite boring, quiet and reserved, but the department store group has enough personalities, from child prodigy and Dean's brother Alex, the football stars, the artistic girl, the bossy little miss, the non English speaking child, and the beauty queen. Similar to a post apocalyptic The Breakfast Club. It's well written, but light on the action. Once the children are safely locked inside, it becomes the story of the democratic community formed within the confines of the store, and the individuality of each character. I would love there to have been potentially more disaster strikes, more clashes and more dire circumstances, rather than everyone seemingly finding their place. I just needed more.